I’ve been glued to sites like Bleeding Cool ever since June 1st 2011, when DC Comics broke the internet in half by announcing they were restarting all their titles over with #1 issues this September. A move that takes real guts in the publishing area with lots of ramifications. Day and date digital publishing. A new Superman and lots of other characters getting revised origins while others have more or less the same history as before. Bringing back the Vertigo characters like Swamp Thing and Animal Man in monthly series. Even bringing back offbeat characters that I loved, such as Resurrection Man. Expanding the line to 52 monthly titles. Wow. DC has done reboots before—hard ones and soft ones. The silver age Flash which debuted in Showcase #4 (1956) was a totally new character in a new universe, even though it wasn’t billed as such and the ramifications were apparent later. DC salvaged their earlier history by declaring that the golden age characters existed on Earth-2 and having lots of crossovers with them—a trick they could pull again in this modern era if they wished. 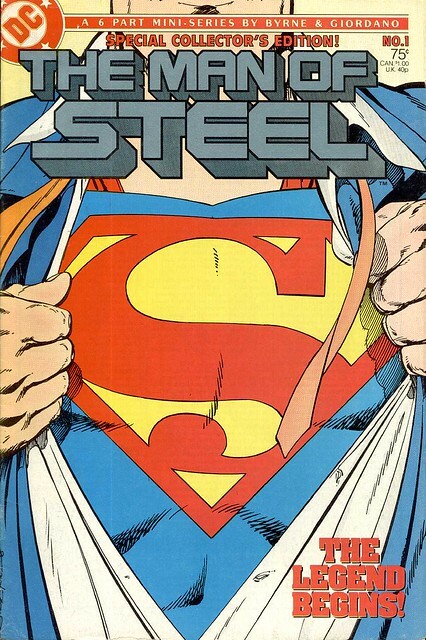 And then of course, there was John Byrne’s Man of Steel mini-series in 1986, which totally revamped Superman’s origin. Byrne’s artwork made Superman more dynamic and exciting than he had been in years, but his changes took away a lot of things that impacted the overall DC mythology. No Superboy, no Legion of Super-Heroes, no early involvement in the Justice League. The 1986 period was a strange time. You had characters like Superman and Wonder Woman who were totally revised. Then you had characters like Batman with a “soft reboot” which just meant that his world shifted more towards the Dark Knight. And then there were characters like the Teen Titans, DC’s most popular title, with hardly any changes at all. In some ways, this new reboot is like that one—I don’t get the impression that DC is messing around with Batman or the Green Lantern titles—the best selling comics in their current line. What is unprecedented is restarting all DC Comics with issue #1 and redesigning the costumes of almost all the characters. If you were buying comics in the 1990s, you will remember Heroes Reborn. 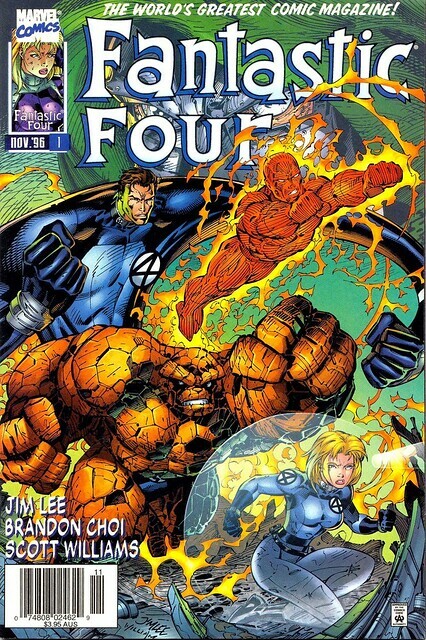 Essentially Marvel turned over the writing/drawing/editing of the Fantastic Four, Captain America, Hulk, and Iron Man to Image Comics founders Jim Lee and Rob Liefield. Each book had character redesigns and Image-style artwork, and the character origins were also revised. Sales on the first few issues were spectacular, but when the stories didn’t pan out, the event failed miserably. Heroes Reborn resulted in the Heroes Return event, where Marvel’s editorial offices took back the titles and put A-list creators like Kurt Busiek, George Perez, Mark Waid, etc. on them. You have to think of Heroes Reborn in conjunction with this new DC Comics restart. Jim Lee is playing a major role in this, redesigning characters and drawing the Justice League title. Bob Harras, who was editor in chief at Marvel during the 1990s, is now editor in chief at DC Comics. Even Rob Liefield is involved, drawing the new Hawk and Dove title for DC. Interesting, too, that Scott Lobdell, one of Marvel’s top writers in the 90s, is working on Teen Titans, Superboy and Red Hood and the Outlaws. What happens if DC’s reboot fails this time? Easy. There will be a new major event crossover which will undo the results of Flashpoint and the old characters will return. Just like Heroes Return. I’m not saying this new restart will fail, it could work. But if things go sour, we all know what to expect. The other thing about this restart (DC doesn’t want you to call it a reboot) is that by renumbering all titles at #1, they get an opportunity for old and new readers alike to jump onboard. And this again reminds me of two past events. Zero Hour, from 1994. There was one month where DC Comics published #0 issues of their entire line. There was a lot of excitement as fans had the impression that important events could happen in one of these issues. Continuity effecting events! 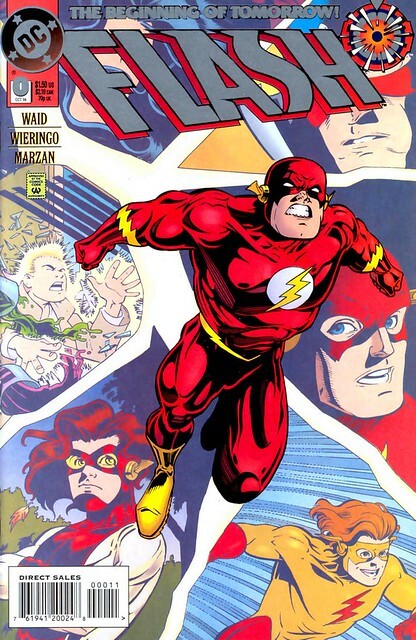 I can’t remember if they did, but two issues really stand out: Flash #0 had a terrific story about Wally West travelling into the past and meeting himself as a kid. Starman #0 was a great beginning to James Robinson’s series. However, the point I am trying to make here, is that by doing such a stunt you have a likelihood that comic fans with a collector mentality will pick up all #1 issues. I know I bought all of the #0 numbered issues back in 1994. DC One Million was another such event in 1998. One month where all titles were published with a 1,000,000 numbered issue. One of DC’s best events, in my opinion, great cover designs on all these comics. My subscription service at the time had a special deal if you bought all the issues with this special number. If DCBS provides a great deal, there is a likelihood that fans will give these #1 issues a try en masse. The day and date digital publication is also a bold move, one that was inevitable. Look for Marvel to follow suit at some point. My problem with their digital publication is that you are locked into Comixology or another service. You don’t really own the physical file, like you do when you buy an MP3 from Amazon. I can’t see spending any money on digital publication until that issue is resolved. I think you have to give the editorial/publishing arm of DC Comics credit for such a daring move. They have to make some drastic action—sales are on a downward spiral. Part of that spiral, though, is because titles like Superman and Wonder Woman have been in a creative slump for years. Superman is definitely getting a “hard reboot” (see Rich Johnston’s speculation on Grant Morrison’s possible plan). This wouldn’t be so painful to many fans if we hadn’t already fallen in love with the “soft reboot” created by Geoff Johns and Gary Frank in Superman Secret Origin. This story updated Superman’s origin but also brought back a lot of the classic Silver Age elements that longtime fans had missed: Superboy, the Legion of Super-Heroes, movie Krypton, etc. That was just a year or so ago. Now all of that is totally gone? I am in a personal quandary over the new DC Comics reboot/restart. Should I jump onboard and should I just stop collecting comics? My collecting habits have dwindled down over the past year. On the Marvel side my lone title is Allen Heinberg’s Avengers Childrens Cruade. On the DC side, I was picking up all Green Lantern titles, the Legion of Super Heroes, Flash, and Brightest Day. The GL comics, while good, seem to be getting watered down by too many stories over all the titles. The Flash has been a bit of disappointment—I love Barry but he’s not as great to me as Wally West. The Legion book is a blast from the past, the only problem is, I could probably pick up a 1980s Legion comic and get the same story. A lot of the new comics from DC in September are very attractive from the short descriptions: Justice League, Action Comics, and Fury of Firestorm on the main superhero line. Justice League Dark (Deadman and John Constantine on a team book, yeah! ), Swamp Thing, Demon Knights, and Resurrection Man all look interesting. Here is the main problem with this new DC Explosion. Usually when a publisher launches a new title, there’s a lot of promotion around it. A publisher’s marketing arm works like crazy, lining up ads, interviews, previews, etc., just to get a new title launched. Now DC Comics has to work like crazy to get readers to buy new comics with characters a lot of them never heard of. Jeff Loeb has a theory, which he has espoused on Word Balloon many times, that a publisher like DC Comics has the greatest success when they focus on the Big Five characters: Superman, Batman, Wonder Woman, Flash, Green Lantern. Any effort outside of that to publish a winning book is difficult. DC Comics’ biggest gamble this September isn’t that you will buy new #1 issues of the Justice League—the publisher is gambling that enough readers will also buy Demon Knights, Resurrection Man, Sgt. Rock and the Men of War, Grifter, and Voodoo. These titles have zero name recognition among many comics fans and to outside readers, none at all. This is DC’s biggest mistake in my opinion. They should have released a core set of books in September and doled these other series out in the successive quarters when they could have the marketing push the creative teams deserve. I love the crew at DC Comics and admire the heck out of their chutzpah. But I have a bad feeling about this. Will the new DC Explosion be followed by an all new DC Implosion? I hope to the New Gods that won't come to pass. Nuff Said! What an awesome run down! I agree I think rolling releases would've been safer, even my wallet is having to leave some it would like to pick up behind! I hope people take a chance on something different with at least one pick. But then the other is like you say - thinking well is this also a good place to jump off? Getting off the Merry Go Round has some appeal. I really did not buy any Ultimate comics, except for the Ultimates series by Millar and Hitch. I just have no connection to those versions of the characters. I will probably wait and see how this plays out. If any series are really good, I can pick up the collections. I quit collecting in the 80's and have only followed comics in passing. They got too expensive and I wanted a real life, and they started making a lot of changes in heroes and villains for no apparent reason. I have read where many comic fans claim the characters have such convoluted histories that they can no longer follow or identify with that character. Too many cataclysmic changes and too many cosmic level events just become confusing and meaningless. After all, we can't really comprehend the vastness of the universe, so claiming that heroes on this tiny planet have staved off a being that can threaten the entire thing is flat out inconceivable, and likewise that even the most powerful would even be more than a gnat to such a powerful being. Too many time travelling or dimension hopping plots also make stories too far fetched, even for a crowd that accepts people who lift tons or run faster than light. Then the ultimate problem is that it boils down to a fistfight between hero and foe, with the bad guy either seemingly destroyed (knowing he's not) or trotted off to jail only to be freed or escape later. Completely unsatisfying. The new DC reboot seems to be all flash, with the heroes acting like arrogant, spoiled kids whose first instinct is to punch someone in the face, then ask questions. Their level of intelligence seems to be at the 3rd grade, consisting of "show me yours and I'll show you mine", judging from the Justice League #1. No explanation why their costumes would all be so similar, after making such a point of making them all look like they frequent the same tailor, and very generic monstrous foes we don't have to worry about whether they are killed or not or have rights. I don't see how this will fly except among teens.